ANGEL was formed in 1975 by guitarist Punky Meadows and bassist Mickie Jones in Washington, D.C. After becoming the house band at Bogeys the group built a strong following and eventually managers and record companies started to come around. Gordon Fletcher, a writer and reviewer for Rolling Stone and Creem Magazine would frequent the club and took notice of the band. Fletcher invited Gene Simmons from KISS to see them perform. Simmons was not only impressed, he was “blown away”. That summer, ANGEL signed a management contract and relocated to Los Angeles. Their manager financed the recording of their first album with producers Big Jim Sullivan and Derek Lawrence. Casablanca Records signed ANGEL to a multi-album deal upon the recommendation of KISS without hearing a single note or seeing the band live. On October 23, 1975 their debut album was released and ANGEL was voted best new band by the reader’s poll of Circus Magazine. During that same year, ANGEL was awarded a gold record for the best and most promising new band in Japan. 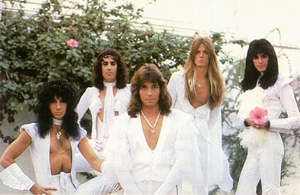 Their legendary live performances included an elaborate stage show incorporating magic tricks by magician Doug Henning, pyrotechnics, smoke, an incredible light show, a larger than life talking angel named Gabriel, members mysteriously appearing and disappearing onstage, and angelic all-white costumes. Many critics labeled them a glam band due to their flamboyant image. The progressive rock style from the first two albums would eventually evolve into mainstream hard rock on the 3rd and 4th albums. Later, due to record company pressure, the band adapted a more commercial rock sound with strong melodies and pop sensibilities as evidenced on their 5th album. The group released a total of eight albums: Angel, which includes their signature song "The Tower", Helluva Band, On Earth As It Is In Heaven, White Hot, Sinful, Live Without A Net, An Anthology and In The Beginning. Their television appearances included American Bandstand, Don Kirshner’s Rock Concert and The Midnight Special. The White Hot album included a version of THE RASCAL’s “Ain’t Gonna Eat Out My Heart Anymore” which became ANGEL’s highest charting single reaching #44 on Billboard. ANGEL toured non-stop for years with such names as RUSH, AEROSMITH, STYX, TED NUGENT, BLACKMORE'S RAINBOW, BOB SEGER, ZZ TOP, BLUE OYSTER CULT, JUDAS PRIEST, PETER FRAMPTON and many others. The group traveled to Japan for a highly successful tour which included two nights headlining the legendary Budokan. Upon arriving at Narita Airport they were greeted by hundreds of screaming fans. In the film Foxes starring Jody Foster, ANGEL appeared as themselves and their songs "20th Century Foxes" and "Virginia" were included on the film’s soundtrack. "Wild And Hot" from the Sinful album was used in the KISS film, Detroit Rock City. Finally, in 1980 the band decided to call it a day. Years later a revamped version of the group was formed featuring DiMino and Brandt along with several new members. This resulted in a new album and live shows in Europe and the USA. Since the band’s heyday each member has moved on to various music projects and business ventures. Frank DiMino became a well-respected vocal coach and in-demand session singer, receiving a platinum album for his vocal contribution in the blockbuster film Flashdance. In 2015 he released his solo album Old Habits Die Hard under the moniker DIMINO. Keyboardist Gregg Giuffria formed the AOR bands GIUFFRIA and HOUSE OF LORDS resulting in several hit singles and international success. Bassist Felix Robinson toured with 707 and played on WHITE LION’s album Fight To Survive. Drummer Barry Brandt played on many LA sessions with different artists. Guitarist Punky Meadows, whom Frank Zappa immortalized in the song "Punky’s Whips" will release his debut solo album in May, 2016. Tragically, founding member and original bassist Mickie Jones passed away from cancer in 2009.